Charlie holds a bachelor's degree in psychology from the University of Florida. 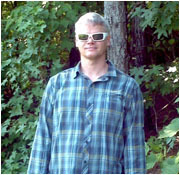 He founded the Kentucky Bigfoot Research Organization in 1997 to document all credible bigfoot encounters in Kentucky. For over two decades he has interviewed countless witnesses and conducted investigations in the hopes of one day proving their existence. He believes bigfoot to be a "flesh and blood" unidentified hominin, very closely related to humans. One day he hopes to establish laws in Kentucky to protect these magnificent creatures. Don is a lifelong Kentuckian. 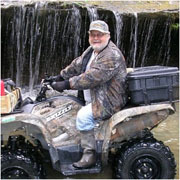 He has been a licensed and ordained Minister for 45 years, the President and Founder of 2 church organizations, an Honorary Kentucky Colonel, a trained tornado spotter for the NWS (National Weather Service) and a storm/tornado spotter for the local TV station (Channel 25 Evansville, IN) and an accomplished Guitarist. In 2005 he received the Presidential "Flag and Wings" lapel pin from former Secretary of State "Colin Powell" as an Ambassador of Goodwill for the state of Kentucky. Don has been interested in the phenomena of Bigfoot/Sasquatch since he witnessed the Patterson-Gimlin film back around 1968 when he was only 14 years old. Then after traveling in 32 states in 26 years in the ministry he heard Bigfoot stories from many different people and places. From the Indians on the reservations in Oklahoma and Arizona, to alligator and hog hunters in central Florida, to ranchers in East Texas, to a real modern day cowboy in Oregon. Don became convinced that all of these people could not possibly be wrong, and their basic descriptions were almost the same. Joy is a s Senior Consultant specializing in the healthcare and nonprofit arena as well as a graduate school adjunct professor and published researcher, holding a doctorate in Public Administration from Tennessee State University. Joy has lived in Middle Tennessee her entire life but has traveled the world as a consultant. She is an animal and nature lover, previously serving as the Board Chair of a local no-kill animal shelter and currently rescuing orphaned and injured wildlife for rehabilitation. 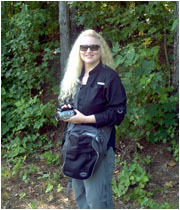 Her interest in bigfoot studies began as a child and she has continued her research which includes several visual encounters of her own. Her goal is to further the knowledgebase to help the public understand the truth about these amazing creatures. 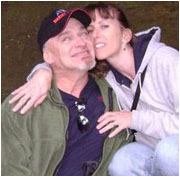 A Kentucky native, Dana is Charlie's wife and works as an Administrative Assistant for an independent school. She brings to our team: curiosity, constructive skepticism and a fearless attitude. Because she is not a 100% "believer," her skepticism and curiosity contributes to a healthy, debunking prospective. She seeks more evidence to become a 100% believer. 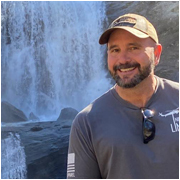 Ben is a consultant with a major IT company and resides in middle Tennessee. Although he has heard several vocalizations and tree knocks, and has experienced rock throwing, he strives to have a visual encounter for the ultimate proof that Bigfoot does exist. Ben enjoys soccer, disc golf, and biking as well as camping and hiking in the woods in search of these elusive creatures. He contributes an open mind and the technical acumen helpful in conducting research. Ben’s overall goal is to further Bigfoot conservation efforts. Karen is a Certified Personal Trainer, mother and wife. Through extensive research on the origin of Bigfoot, she believes Bigfoot is a hominid, much closer to humans than apes. Studying the theories presented by Loren Coleman and Archeologist, Kathy Strain, she believes Native Americans have been living with these creatures for centuries, long before white man appeared on native soil. She believes they have a language, culture, and despite their elusive behavior, they are social. Being part Indian herself, she feels she’s able to relate in some sense with Native Americans. 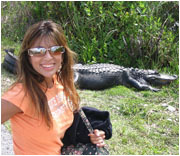 Also fluent in Spanish, Karen is able to conduct interviews with Spanish-speaking witnesses. Karen is eager to prove their existence and she knows one day soon science will confirm her beliefs. Terry’s amazing sketches help us place an image with a report. He has always felt there may be other cryptids out there and that we are not the only primates which are bipedal. Terry is open to all theories and knows there are things out there that "logic" simply cannot explain.